Syriza victory: Turning point for EU? On Klathmonos Square, the flags were flying high, supporters of Syriza were singing and dancing, there were hugs and tears and broad beaming smiles. Alexis Tsipras will now try to lead an anti-austerity revolution, backed by a strong democratic mandate. 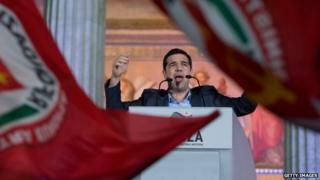 He said in his victory speech that he is willing to negotiate with Greece's European partners. The question is: how much are they prepared to compromise with him? Syriza wants to reverse cuts in public services and increase salaries and pensions again. It wants to write off a large chunk of Greece's huge public debt, most of which it now owes to other governments in the eurozone. So this is a landmark moment, in both Greek and European politics. And there will be some testing days ahead. There are some things during the eurozone crisis that we were told would never happen. The European Central Bank would never flood the market with new money, and Greece would never take a gamble with the radical left. The past few days have overturned those assumptions, making this week a potential turning point in the recent history of the European Union. Those who have muttered that Syriza's policies are mad, that its leaders are deluded, are now going to have to deal with the reality of this decisive election victory. Syriza, too, is bound to face some setbacks - it will have to come to terms with the difficulties of governing. But many Greeks voted for the party for the first time for a simple reason - they offered hope. And in politics, hope can be a powerful thing.